Since most organizations view the facilities, engineering or operations departments as a non-revenue driver, they don’t invest in modern information management systems. New data collected by AIIM.org and ARC® in a recent survey, however, suggests that failure to optimize facility management is preventing facilities teams from properly preparing for catastrophes. 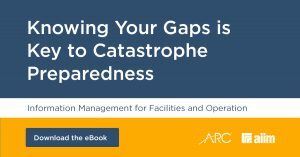 The eBook, “Information Management for Facilities and Operations: Knowing Your Gaps is Key to Catastrophe Preparedness,” also reveals that poor information management in facilities departments is hurting the bottom line. In a new eBook, Bob Larrivee, VP and Chief Analyst of AIIM Market Intelligence, presents data that sheds light on the state of facility information management. Organizations are losing tens—sometimes hundreds—of thousands of dollars each quarter to a variety of problems caused by poor information management. Emergency readiness: Expect a catastrophe every two years at a cost of $500,000 on average. Productivity: Facility managers spend one hour daily on average retrieving necessary building information. Equipment repair budget: Each year $81,000 is spent on average to repair equipment covered by warranties. Knowledge transfer process: 29% of workers are 55 years or older which makes succession planning a critical must-do. The lack of centralized facility information has a ripple effect on a surprisingly large number of activities that tie directly to any company’s bottom line. AIIM’s research digs deep into the problems that poor information causes or worsens. It starts with emergency readiness, but extends to risk mitigation, employee productivity, customer service and more. In short, the report makes it clear that information chaos is a major obstacle to achieving operational excellence. A few perks of using the cloud identified by the report included mobile access, improved collaboration, and information risk management, among others. The study also found that facilities teams are starting to see these benefits, and acting accordingly. Still, fewer than one in five facilities teams has access to building information through the cloud. Some facilities professionals have their information stored digitally, but even digital files are subject to risk, as the report shows. Physical storage remains an option, but again, paper is easy to lose and subject to damage. Not to mention, maintaining and organizing a database of paper or digital files is a monumental task. The report shows how managing information in the cloud reduces overtime, boosts productivity, eliminates costs, and facilitates emergency preparedness. Moreover, the report made it apparent that while most facilities teams had done some emergency planning, many believed there was more work to do. In the facilities world, however, natural disasters aren’t the only catastrophe to be ready for. In fact, the report showed that the most common type of catastrophe was “Power Equipment Failure” with an average cost of $372,754 per event. Floods, hurricanes, and tornadoes followed closely behind, but the point remains: Facilities teams face a wide range of costly catastrophes. And better information tools can help them prepare, respond and recover. Emergency readiness and post-catastrophe recovery are closely related. The eBook details some of the biggest challenges facing organizations attempting to recover from disasters. Among those challenges, “access to information” and “bringing systems back online” stood out. Further, less than one in six facilities, operation, and engineering teams reported feeling as if the information they would need during an emergency was in place. On the modern business landscape, disasters are no small issue. They might not happen often, but even one extended period of inactivity can be lethal to any organization. Information is the critical link in post catastrophe recovery. It allows responders to execute a coordinated plan, shut off utilities, or establish backup power, among other necessary tasks. That’s why efficient information management is a vital tool in any business risk mitigation strategy. Because the general perception is that facilities department don’t drive revenue, managers and technicians are rarely armed with the latest tools. But these new findings indicate that this could be a significant oversight. Effective succession planning without accessible building information was also shown to be costly and time-consuming. The research showed that the efficiency of day-to-day operations suffers from lack of access to certain documents. Even properly managed warranties were revealed to be a significant, avoidable cost to many businesses. Effective succession planning without accessible building information was also shown to be costly and time-consuming. The data showed that almost one third of facilities teams are run by workers over the age of 55. The inability of most facilities team to capture information from these retiring employees presents a costly challenge when it comes time to onboard new employees. These challenges tie directly back to emergency preparedness. By improving information management strategies, employees can calmly access the information they need, when they need it. The eBook, “Information Management for Facilities and Operations,” covers these themes (and more) in much greater detail. To dig into the data, and learn more about new opportunities to improve how your organization operates on a daily basis and in the face of an emergency, download it now. Jessica Gopalakrishnan is the director of demand generation marketing at ARC. Her expertise lies in educating, inspiring and transforming how we view technology and brands. 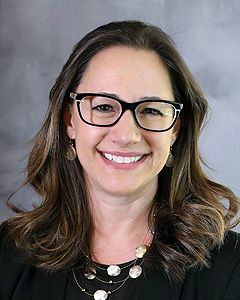 For over a decade, she has shared innovative solutions with diverse audiences in SaaS/software, including Excite, Cisco Systems and Turnitin.